If you have ever lived with severe chronic pain, then it will be easy to describe what it means to have met Dr. Zachary Lipman. “Divine intervention” comes to mind. Imagine a time when it hurt to get out of bed, or to walk, or to even keep your head up. It is very mentally draining when you constantly hurt in some way. Unfortunately, odds are you know just what I'm talking about. Chronic pain has a prevalence of over 40 percent. Is this how life is supposed to be? You might ask yourself. So you go to the chiropractor. You try herbal supplements and over the counter medications. You try acupuncture. Your doctor has ordered physical therapy and perhaps prescribed opioids or other medications. Nothing seems to adequately overcome the daily grind. Or worse, you have a narcotic dependence in addition to your unrelenting pain. Luckily, if you live in the Chico area, Dr. Lipman has dedicated his life to solving problems, and your pain is top of his list. Dr. Lipman studied engineering at the University of Vermont and actually intended to become a professional civil engineer. Finding solutions to complex problems was his greatest passion. Soon, his heart fell into the realm of helping people on a more personal level, and he decided to go to medical school to become an anesthesiologist. 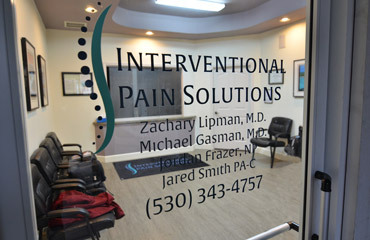 Dr. Lipman spent 10 years in Redding working with patients to relieve their acute and chronic pain and then he came to Chico to open a full service interventional pain management practice. The practice, Interventional Pain Solutions, offers therapies that are far beyond my comprehension, but upon visiting the office for one day, I witnessed patients walking out with joy and relief. Years of pain reduced by over half. Interventional Pain Solutions provides so many types of pain management interventions which are too detailed to list here. But empathy, care, and personal compassion are a high priority and are therapeutic by themselves. This is a place of relief for those who have been suffering far longer than they should have. Dr. Lipman and his team of professionals take the time to look at the whole patient in considering treatment options. From a variety of procedures to psychological counseling to specialized physical therapy, he addresses all aspects of their well-being. Up until recently, there has been a dearth of full service pain management practices in this area. In the recent past, patients would have been triaged directly to a neurosurgeon for evaluation and workup of pain which may or may not lead to surgery. But now with this office open, a visit to the pain management specialist should not be a last resort, but rather an early solution to helping patients find relief from chronic pain. Dr. Lipman offers solutions that help patients live happier, healthier, and more normal lives. The options are cutting-edge: Now offering regenerative injections, platelet-rich plasma and stem cell injections. He offers anesthetic infusions for intractable pain. He offers therapeutic sedation for all procedures. He offers options to help wean patients off of heavy medications by managing pain in a healthier way. This is what gives Dr. Lipman the most joy. When he can see the relief in his patient's' eyes, it serves as a reminder of why he loves what he does so much. Dr. Lipman’s first priority is to create a better quality of life for his patients. For him, this job is not just helping to fix pain issues, but providing hope as well. And when you are in pain and feel like there is no solution, hope is a godsend.